So this month marks one year since I started my full-time freelancing adventure! For this year in review I thought I would share some of my top tips for taking the jump into the freelancers world. Budget, budget, budget! This is so important, especially if you're coming into freelancing from a full-time job where you'd have nice even payments deposited into your bank account each month. Don't under charge for your services. When I first started I found it really difficult to get my head around all the numbers and making sure the paid hours I was working were worth my time. Luckily I had some business advisors on hand who helped me work out my survival budget so I knew exactly how much money I'd need to well...survive. With a figure in mind I was then able to work out my hourly rates. There are lots of websites out there that can help you work out the rates you need taking into account holiday, sick days etc... This hourly rate calcuator by Beewits is a great little tool! Don't be afraid to charge what you're worth, creatives need to be able to pay your bills too. Working from home can get lonely so make sure you get yourself out there. Luckily for me Leicester has a large creative community with lots of networking events on and great venues like The Phoenix, The LCB Depot and my fave cafe (with the most delicious cakes) Bru Coffee where you can sit and work all day. Social media is your friend but don't let it take over. Scheduling time to update your accounts and catch up with other people in your network is a great way to get the best of your social media. I know from experience that it can easily get out of hand and you'll find you've spent 2 hours on Facebook in just one day! I would recommend only committing to a few social media accounts at once, at the minute I'm using the big three Facebook, Twitter and LinkedIn. And as a visual artist I often use Instagram, which is full of hundreds of inspiring artists to follow and share my work with. Enjoy yourself! Working for yourself allows you the extra freedoms and control that you could never get when working a 9-5. Like any job there will be ups and downs. Perhaps you're just having a bad day, dealing with difficult clients, or you've just lost loads of work due to a computer crash (or even worse... you saved over your own file! >.<) but whatever happens it's never the end of the world! Tomorrow is a new day and you can dust yourself off, and start again. For me the positives have outweighed the negatives and I try make these my focus whenever I'm feeling blue. 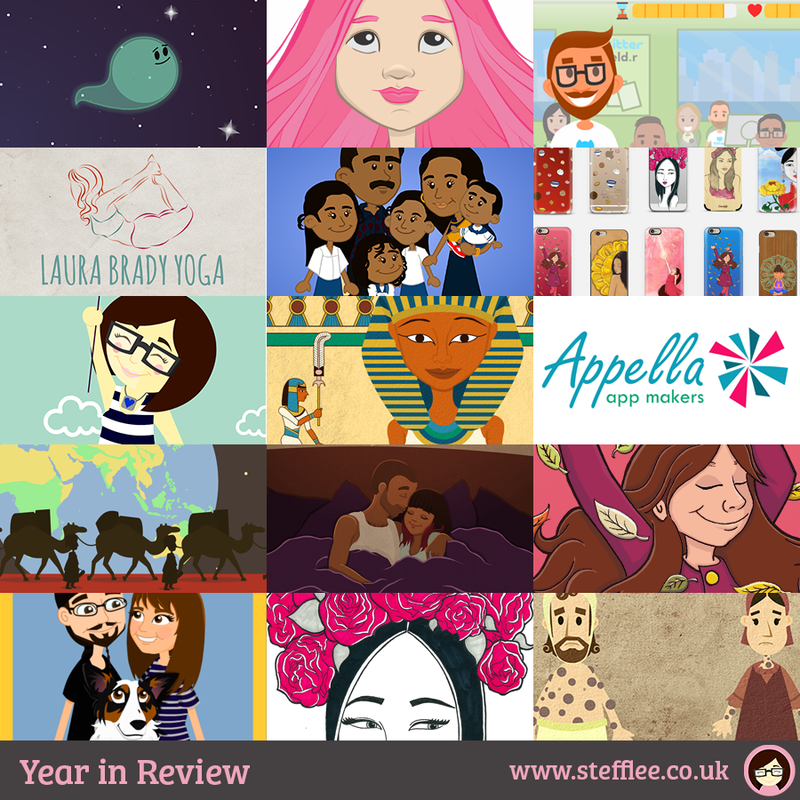 This year has been a steep learning curve for me but with 5 animations, 1 website, 1 mobile app, 3 logos, many illustrations and setting up my own shop I'm amazed with what I've been able to achieve in my first year. After lots of stumbling blocks I'm determined to work harder, get more projects and continue the learning process this second year. To see all the different things I've been working on check out my brand new homepage where you can now learn about each of the services I have on offer and visit my updated portfolio.